After his wife’s sudden death, Peter Bourke realized he needed something more than parenting and a career to restore balance in his life. Although he did not know how to sail – and despite the fact that his friends thought he was crazy – he bought his first sailboat and embarked on a series of offshore solo voyages that included the Bermuda One-Two. A decade later, when his daughter and son had finished high school and he was 57 years old, Bourke entered the Oldest Singlehanded Trans-Atlantic Race (OSTAR), a 3,000-mile passage from Plymouth, England to Newport, Rhode Island. Bourke brings the reader aboard his Outbound 44 Rubicon to share the highs, lows, challenges and solace of sailing alone across the Atlantic for 40 days, recounting experiences in the Vietnam War, his many marriage proposals before Gail finally said “yes,” and how he found the courage to tell his young children that they had lost their mother. “The captain of a sailing vessel must be a craftsman who can fashion his boat and his behavior to the rhythms of the sea,” Bourke writes. “At the end of a passage, that ephemeral construction that was the passage goes to memory, where it cures and reflects who you are.” Elegantly written with humanity and humility, Sea Trials is insightful and inspiring. Peter J. Bourke was born in London, England and came to the U.S. at age six. After serving in the Marine Corps for three years, he attended college on the GI Bill. He retired from a successful Wall Street career to sail. Bourke lives and sails out of Newport, RI. 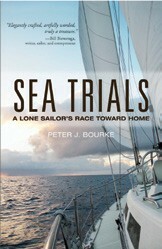 Sea Trials is his first book.